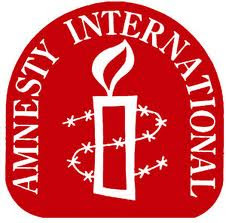 Today's radio show started with the Amnesty International report about continuing abuse and torture in Iraqi prisons where as as many as 30,000 are reportedly being held without charge or trial - the 59-page report criticizes American troops for handing over detainees to a system marred by a "culture of impunity" dating back to Saddam Hussein. The US and Iraqi governments both denied the allegations, but a special report from Al Jazeera takes a look inside Iraq's "torture dungeons" and documents a case of extraordinary abuse which is characterized in the Amnesty International report as a not uncommon occurrence. As a jumping off point for a discussion about Harper and his summer of inexplicable behaviour we began with Jonathan Malloy's opinion piece from the Globe and Mail last Tuesday which asks: Why does the Harper government do what it does? His conclusion is ...that this is a stubborn government that refuses to admit mistakes or back down. This almost sounds reasonable, but this is where we beg to differ. This is an ideologically driven government whose policies reflect the beliefs and desires of the less than 30% of Canadians who voted them into the minority situation. The rest of us and our opinions and policy preferences can all go hang for all Stephen Harper cares. It's that kind of arrogance that leads the demise of Parliamentary governments all over the world -- we can hardly wait. Even within his own party, Harper's judgement is being questioned as Quebec MP Maxime Bernier has joined other Conservatives, particularly from Western Canada, who are reportedly angry at the proposal to fund the proposed Quebec hockey arena. The muzzling of federal scientists by the Harper government is a great example of an ideological gang of Tories on the loose in Ottawa -- they've gone as far as controlling when and what they can say about issues as obscure as floods at the end of the last ice age. Natural Resources Canada scientists were told they need the “pre-approval” of Minister Christian Paradis’ office to speak with national and international journalists. This work is financed by taxpayers and Canadians are being cut off from information of significant public interest — be it about fish stocks, genetically modified crops or mercury pollution in the Athabasca River. There was Howie Kurtz of CNN's Reliable Sources getting one right for a change, about Sean Hannity of Fox News selective edit of President Obama's speech Monday -- making it sound as though Obama uttered the opposite of what he actually said and only five days after John Stewart did it first. Then it's the David Neiwert (Crooks and Liars .com) piece and the threat posed by the longest-running, most consistent and in fact currently fastest-growing domestic-terror threat in the US, which comes from a component completely ignored in the Bipartisan Policy Center's recently published report: and that is radical right-wing American extremists. My guest the K-man of Beyond that Graveyard pointed out that the people in question are individuals loosely affiliated with white-supremacist groups but not part of any organized terror campaign like those in league or being recruited by radical Islam. Good point, they are terrorists nonetheless and as capable of inflicting as much horror as Timothy McVeigh and should not be taken lightly. Finally, the anniversary of 9/11 and the various protests and remembrances that took place in the US on Saturday. In New York rival demonstrations took place after family members of Sept. 11 victims recited loved one's names at a somber ceremony marking the ninth anniversary of the terrorist attacks. After the ceremony, around 2,000 activists rallied about five blocks from the site of the 2001 attacks to support the proposed Islamic community center. About 1,500 mosque opponents gathered nearby, chanting "USA, USA" and "No mosque here." Center supporters carried signs with such slogans as "The attack on Islam is racism" and "Tea Party Bigots." It's interesting to note that most of the protesters are as Adam Weinstein says, ...the least likely to appreciate the American faith that the towers and their city embodied. On the lower end of the intellectual spectrum, these critics are the insular drones of militant Americanism, people who think New York's melting-pot mentality is an enabler of evil, rather than a desirable social end. Take a look for yourself and see if you think the tea party protests are inspired by something other than racism and xenophobia. Karoli over at C&L says she can't recall a year ...where public insanity has been driven to such a fever pitch since the day it happened, and she's right. This year has been far worse than previous years and the tea party and the GOP are responsible -- thankfully Obama stood up and said "We are not at war against Islam. We are at war against terrorist organizations that have distorted Islam or falsely used the banner of Islam to engage in their destructive acts." Sadly it seems as is only half the country is listening to him and the other half is happy to ignore the decent sentiments expressed therein and continue their long drive off the cliff. The real winner here are the terrorists who have succeeded far beyond their imaginings. The US is bitterly divided, the government has given itself the power to spy on its citizens with impunity and freedoms have been curtailed all in the name of security. 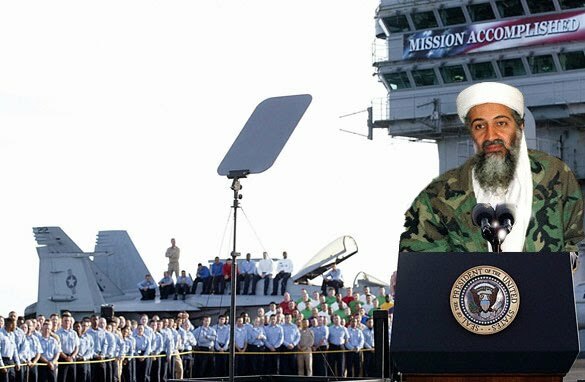 Throw in two unwinable wars, trillions in lost treasure, a world that now looks upon the US with distrust and the dead servicemen and women and maybe Osama should schedule himself a photo-op on some aircraft-carrier in the Gulf where he can declare "Mission Accomplished."